This page highlights some bird images I have taken from around Champaign County in East-Central Illinois as well as from other areas in the midwest United States during travels. Localities include my own backyard in Southwest Champaign, nearby parks such as Meadowbrook Park, Crystal Lake Park, Busey Woods, and Robeson Park, as well as the natural areas near the Sangamon River at the Foosland Spotsmen's Club in Northwest Champaign County. Photos from visits to Youngstown, Ohio in north eastern Ohio, and Anderson, Indiana in east central Indiana also are included. Where possible, I have provided the best images I have personally taken of the bird in question. In some cases, I have a confirmed sighting of a bird, but the only picture I have is sub-optimal. With any luck, time will provide more opportunities to obtain better images in these cases. This image of a black capped chickadee was taken on November 19, 2012 in Mill Creek Park, Youngstown, Ohio. This image of a lapland longspur was taken on February 16, 2014 at the grain elevator near St. Mary's Road and first street, Urbana, IL. This image of a snow bunting was taken on February 16, 2014 at the grain elevator near St. Mary's Road and first street, Urbana, IL. This image of a female American redstart was taken on September 15, 2012 from Meadowbrook Park, Urbana. This image of a pine warbler was taken on April 20, 2013 in Meadowbrook Park, Urbana, IL. This image of a palm warbler was taken on April 21, 2013 in Meadowbrook Park, Urbana, IL. This image of an ovenbird was taken on May 24, 2013 in Busey Woods, Urbana. This image of a common yellowthroat was taken on May 27, 2013 in Meadowbrook Park, Urbana. This image of a Wilson's warbler was taken on September 1, 2013 in Meadowbrook Park, Urbana, IL. This image of a bay breasted warbler (male non-breeding) was taken on September 29, 2013 in Crystal Lake Park, Urbana, IL. This image of a Northern parula was taken on September 29, 2013 in Crystal Lake Park, Urbana, IL. This image of a yellow rumped warbler was taken on April 20, 2014 in Busey Woods, Urbana, IL. This image of a black and white warbler was taken on April 26, 2014 in Busey Woods, Urbana, IL. This image of a blue winged warbler was taken on April 27, 2014 in Busey Woods, Urbana, IL. This image of a mourning warbler was taken on May 17, 2014 in Busey Woods, Urbana, IL. This image of a chestnut sided warbler was taken on May 17, 2014 in Busey Woods, Urbana, IL. This image of a Cape May warbler was taken on May 17, 2014 in Southwest Champaign, IL. This image of a Blackburnian warbler was taken on May 17, 2014 in Southwest Champaign, IL. This image of a Magnolia warbler was taken on May 17, 2014 in Southwest Champaign, IL. This image of a blue headed vireo was taken on May 11, 2013 in Meadowbrook Park, Urbana. This image of a red eyed vireo was taken on May 25, 2013 in Busey Woods, Urbana. This image of a warbling vireo was taken on April 29, 2014 in Crystal Lake Park, Urbana, IL. This image of a white eyed vireo was taken on April 29, 2014 in Crystal Lake Park, Urbana, IL. This image of a yellow throated vireo was taken on May 4, 2014 in Crystal Lake Park, Urbana, IL. This image of a Philadelphia vireo was taken on May 18, 2014 in Crystal Lake Park, Urbana, IL. This image of a golden crowned kinglet was taken on October 20, 2013 in Meadowbrook Park, Urbana, IL. This image of a ruby crowned kinglet was taken on October 13, 2013 in Crystal Lake Park, Urbana, IL. This image of a blue gray gnatcatcher was taken on May 11, 2013 in Meadowbrook Park, Urbana. This image of a great crested flycatcher was taken on May 24, 2013 in Busey Woods, Urbana. This image of an Eastern wood pewee was taken on August 25, 2013 in Meadowbrook Park, Urbana, IL. This image of a yellow bellied flycatcher was taken on May 27, 2013 in Meadowbrook Park, Urbana. This image of a Eastern kingbird was taken on June 1, 2013 in Allerton Park, IL. This image of a cardinal in a snowstorm was taken on March 24, 2013 in SW Champaign, IL. This image of a rose breasted grosbeak was taken on May 2, 2013 in SW Champaign, IL. 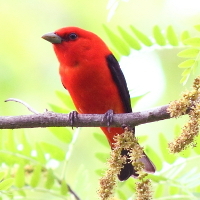 This image of a scarlet tanager was taken on May 27, 2013 in Meadowbrook Park, Urbana. This image of an indigo bunting at a feeder was taken on May 26, 2013 in Busey Woods, Urbana. This image of a cedar waxwing was taken on June 1, 2013 in Meadowbrook Park, Urbana. This image of a cedar waxwing with a fanned tail was taken on November 3, 2013 in Meadowbrook Park, Urbana, Illinois. This image of a red winged blackbird was taken on March 9, 2013 in Meadowbrook Park, Urbana. This image of a grackle was taken on March 21, 2013 in SW Champaign, IL. This image of an Eastern meadowlark was taken on April 28, 2013 at the University of Illinois Field Station in SW Champaign, IL. This image of a brown headed cowbird was taken on April 29, 2012 from SW Champaign, IL. This image of a Baltimore oriole was taken on May 4, 2014 in Crystal Lake Park, Urbana, IL. This image of a Baltimore oriole at a feeder was taken on May 11, 2014 at the Anita Purves Nature Center, Urbana, IL. This image of an orchard oriole was taken on July 3, 2014 near Foosland, IL. This image of a juvenile orchard oriole was taken on May 4, 2014 in Busey Woods, Urbana, IL. This image of a pair of Eastern bluebirds was taken on March 23, 2013 in Meadowbrook Park, Urbana. This image of a hermit thrush was taken on April 20, 2013 in Meadowbrook Park, Urbana, IL. This image of a Swainson's Thrush was taken on September 7, 2013 in Meadowbrook Park, Urbana, IL. This image of a gray cheeked thrush was taken on September 29, 2013 in Crystal Lake Park, Urbana, IL. This image of an American robin was taken on March 24, 2012 at Robeson Park in Champaign, IL. This image of a Veery was taken on May 4, 2014 in Busey Woods, Urbana, IL. This image of an Eastern Towhee was taken on April 14, 2013 in Meadobrook Park, Urbana, IL. This image of a dark eyed junco was taken on November 7, 2012 in SW Champaign, IL. This image of a house sparrow was taken on March 1, 2014 near Busey Woods, Urbana, IL. This image of a fox sparrow was taken on March 9, 2014 in Busey Woods, Urbana, IL. This image of a song sparrow was taken on March 15, 2014 at Meadowbrook Park, Urbana, IL. This image of a tree sparrow was taken on January 11, 2014 in Meadowbrook Park, Urbana, IL. This image of a swamp sparrow was taken on February 2, 2014 in Meadowbrook Park, Urbana, IL. This image of a white throated sparrow was taken on April 14, 2014 at Crystal Lake Park, Urbana, IL. This image of a white crowned sparrow was taken on February 25, 2012 from SW Champaign, IL. This image of a Carolina wren was taken on March 23, 2013 in Meadowbrook Park, Urbana. This image of a house wren was taken on May 27, 2013 in Meadowbrook Park, Urbana. This image of a female goldfinch was taken on September 22, 2012 from Meadowbrook Park, Urbana. This image of a house finch was taken on February 2, 2013 in SW Champaign, Illinois. This image of pine siskins was taken on October 20, 2012 in SW Champaign, IL. This image of a brown thrasher was taken on June 1, 2013 in Meadowbrook Park, Urbana. This image of a gray catbird was taken on May 25, 2013 in Busey Woods, Urbana. This image of a northern mockingbird was taken on May 18, 2014 near Foosland, IL. This image of a crow was taken on November 4, 2012 in SW Champaign. This image of a blue jay was taken on November 21, 2012 in Youngstown, Ohio. This image of a horned lark was taken on February 8, 2014 in SW Champaign, IL. This image of a red breasted nuthatch was taken on November 7, 2012 in SW Champaign, IL. This image of a white breasted nuthatch was taken on March 31, 2013 in Mounds State Park, IN. This image of a brown creeper was taken on December 28, 2013 in Meadowbrook Park, Urbana, IL. This image of a red bellied woodpecker was taken on November 4, 2012 in Meadowbrook Park, Urbana. This image of a Northern Flicker was taken on January 12, 2013 in Meadowbrook Park, Urbana. This image of a yellow-bellied sapsucker was taken on February 24, 2013 in Meadowbrook Park, Urbana. This image of a pileated woodpecker was taken on April 1, 2013 in Mounds State Park, IN. This image of a female downy woodpecker was taken on April 20, 2013 in SW Champaign, IL. This image of a yellow billed cuckoo was taken on May 31, 2014 in Meadowbrook Park, Urbana, IL. This image of a black billed cuckoo was taken on June 15, 2014 in Busey Woods, Urbana, IL. This image of a great blue heron was taken on November 19, 2012 in Mill Creek Park, Youngstown, Ohio. This image of a green heron with a mohawk was taken on April 21, 2013 in Meadowbrook Park, Urbana, IL. This image of a black crowned night heron was taken on July 23, 2013 in Roberson Park, Champaign, IL. This image of a yellow crowned night heron was taken on July 20, 2014 at Kaufman Lake, Champaign, IL. This image of a female ruby throated hummingbird was taken on September 2, 2012 from SW Champaign, IL. This image of a barred owl was taken on September 15, 2013 in Youngstown, OH. This image of a snowy owl was taken on December 31, 2013 in northern Douglas County, IL. This image of a great horned owl was taken on April 6, 2014 in Busey Woods, Urbana, IL. This image of a pair of American kestrels was taken on February 23, 2013 in SE Champaign, IL. This image of an American kestrel was taken on December 27, 2013 in northern Douglas County, IL. This image of a prairie falcon was taken on December 27, 2013 in northern Douglas County, IL. This image of a juvenile Cooper's hawk was taken on November 23, 2012 in Youngstown, Ohio. This image of a red tailed hawk was taken on January 26, 2013 in Meadowbrook Park, Urbana. This image of a gazing red tailed hawk was taken on April 6, 2013 in Meadowbrook Park, Urbana, IL. This image of a Cooper's hawk was taken on May 12, 2013 in Robeson Park, Champaign. This image of a red shouldered hawk was taken on September 16, 2013 in Youngstown, OH. This image of a rough-legged hawk was taken on December 27, 2013 in northern Douglas County, IL. This image of a northern harrier was taken on March 2, 2014 in Northern Douglas County, IL. This image of a juvenile bald eagle was taken on February 16, 2014 on country road 0 between 400E and 500E Champaign County, IL. This image of a bald eagle was taken on February 22, 2014 at Heron Park, Danville, IL. This image of a ring billed gull was taken on February 20, 2014 at the pond at first street and Windsor Avenue, Urbana, IL. This image of a juvenile herring gull was taken on March 11, 2014 at the pond near the intersection of 1st street and Windsor Avenue in southwest Champaign, IL. This image of killdeer was taken on August 30, 2013 in SW Champaign, IL. This image of solitary sandpipers was taken on September 8, 2013 at the Douglas-Hart Nature Center near Charleston, IL. This image of pectoral sandpipers was taken on April 28, 2013 at the University of Illinois Field Station in SW Champaign, IL. This image of a female northern shoveler was taken on September 8, 2013 at the Douglas-Hart Nature Center near Charleston, IL. This image of wood ducks was taken on October 5, 2013 at Shadyside Park, Anderson, IN. This image of mallard ducks was taken on March 9, 2013 in SW Champaign, IL. This image of Canadian geese was taken on March 24, 2012 at Lake of the Woods Park in Mahomet, IL. This image of redhead ducks and greater scaup was taken on February 15, 2014 at the pond at first street and Windsor Avenue, Urbana, IL. This image of a mute swan was taken on February 22, 2014 at Heron Park, Danville, IL. This image of a female common merganser was taken on March 1, 2014 at the pond near 1st street and Windsor Avenue, Urbana, IL. This image of an American coot was taken on March 1, 2014 at the pond near 1st street and Windsor Avenue, Urbana, IL. This image of a common loon was taken on May 13, 2013 in northern Champaign. This image of a ring necked pheasant was taken on April 13, 2014 in Meadowbrook Park, Urbana, IL.